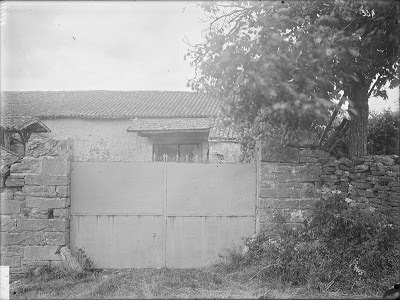 In the previous blog I moaned about some capitals bricked into a wall of a farm in Cluny we had been unable to find. I closed my blog with the more or less profetic words: " It would not surprise me if the wall has been demolished and that the capitals have disappeared to a museum somewhere...."
A pit bull never let go, and the same goes for me when it comes to seeming hopeless search actions. I did not have much to go on. We were looking for a wall giving access to the courtyard of a farm "Ferme Sainte-Odile", not far from the "Porte-Sainte-Odile". All information came from three different websites, although they were somehow interlinked. One of the websites even suggested a possible location on a map of Cluny, but it also rated the reliability of this location as extremely low. The spelling of the farm and the gate was also not very reliable, since Saint-Odile was a man, and certainly not a woman (Sainte-Odile). Cluny is a small town, and we regularly meet well known authorities on several subjects in its streets. People we know include the Mayor of Cluny, the writer of a number of books on local history, and several people involved in organising guided tours and lectures about the history of Cluny. This would not have been the first time that I tackled one of these authorities in the street with a burning question. Suddenly I thought "Why on earth would I wait till I bump into one of them?". It must be possible to find an email address of one of the historians in Cluny, and a search action in my archives brought a brochure to light which had the email address of Jean-Luc Maréchal on it. He lives in an old historical building, and does every so often guided tours, which include a visit to his own house as well. During one of these visits we had bought a brochure, and that was the one I just had found. An email with my question was quickly dispatched, and after that it was just hoping for an answer. 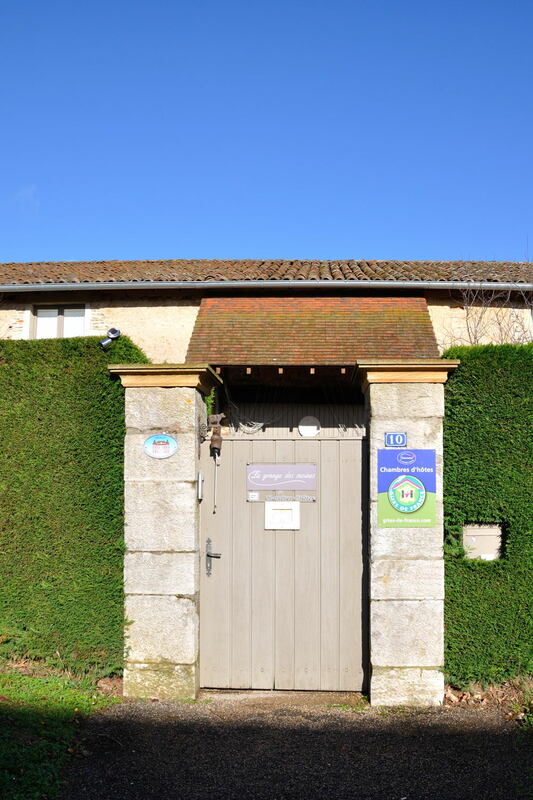 "The 'Ferme Saint-Odile' is located approx. 100 m south of the Chapelle Saint-Odile. The capitals have been removed in the fifties, were on display in one of the abbey buildings, and went into storage in 2010." 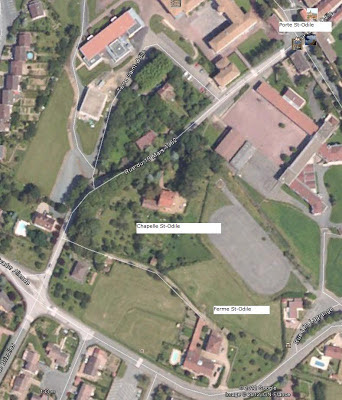 The Porte Saint-Odile is not far from the chapel, and with these data it did not require magic to locate the farm with the help of Google Earth. And once again we went to Cluny, hoping to find at least the old bit of wall. 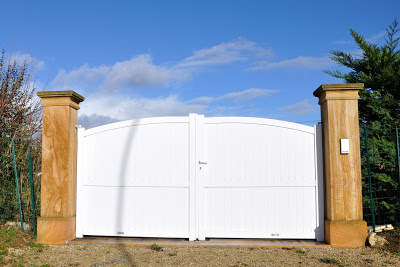 At the farm we found three different gates, all with stone posts, and all with hedges on both sides of the gate. But the farm had two access roads, of which one was closed with a low but locked gate. I just was going to take a picture of the farm which was quite far away at the end of the road using my zoom lens,, when the owners of the neighbouring house came back from a walk. After we had explained to them that we were looking for something that had disappeared years ago, they thought at first that I came straight from the loony bin, but once they realised we were seriously looking for something they defrosted. The man had endless stories about the farm, even though he had never heard of these capitals. 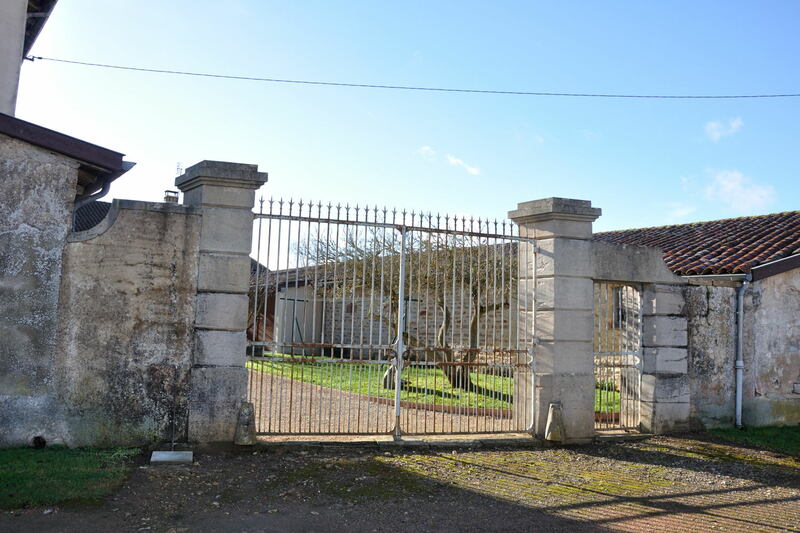 He knew for example that the farm had been built from stones bought from the demolished church Cluny III around 1800. They had right of way on their neighbour's ground, and they opened the gate for us so that we could at least take some pictures of the gate down the road from nearby. The size of the gate looked quite similar to that of the gate on the black-and-white picture, so we thought we had found what we were looking for. But this was THE gate! The original gate and wall had been demolished after the capitals had been saved. Gate and walls were replaced with a new gate, stone posts and a high hedge. The building behind it was still intact, including the lean-to; the extension however had most likely also been demolished. So my last remark on the previous blog was maybe not spot on, but close enough to boast supernatural tendencies! Looking for something, but for what? Cluny is not only famous for its abbey, or for the remains there of. 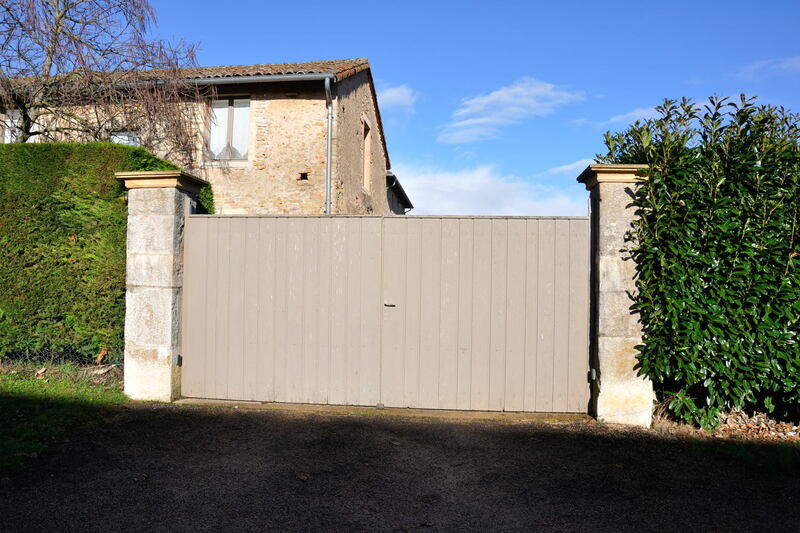 The collection of houses from the Romanesque period is maybe not the biggest, but certainly one of the biggest in France. The old houses in Cluny had some sort of corridor on the first storey, with richly decorated arcades looking out over the street below. There are a few of these so called claire-voies still intact, some in the facades of houses, some in museums. This web page gives a nice overview. ﻿ On still another site a map of Cluny can be found, showing the locations of Romanesque, Gothic and Romanesque-Gothic houses; besides there is also a mlist of all registered monuments. On the list of monuments there were a number of matters mentioned I had never heard of, and the map of Romanesque houses showed a number of houses which, as far as I could remember, had nothing spectacularly Romanesque, at least not on the outside. Since we are in the centre of Cluny at least twice a week (Tuesday and Saturday), it seemed like a good idea, before or after lunch, whichever was most convenient, to look for Romanesque houses with the help of the map and for monuments with the help of the list. 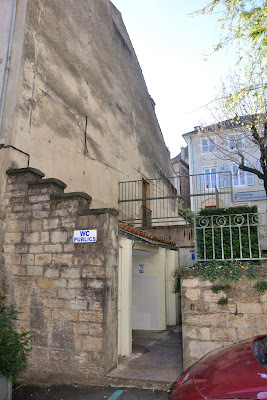 One of the most interesting things we were looking for were the remains of a claire-voie, which belonged to the house on 1-3, Rue de la Chanaise, a house that is regularly mentioned in publications about Romanesque houses in Cluny. 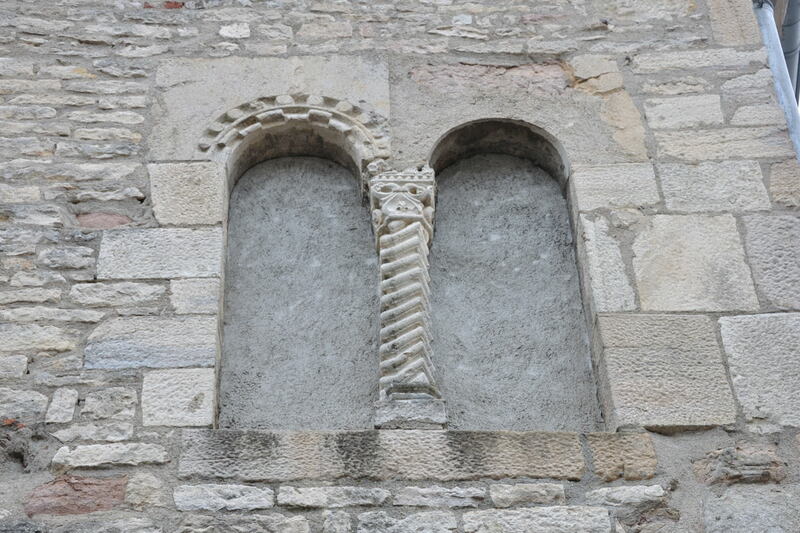 However, we could not find anything Romanesque on the wall of 1, Rue de la Chanaise, and no. 3 did not exist (anymore). Whilst looking for something completely different, one day we approached Rue de la Chanaise from the other side, from the Rue Saint-Mayeul. And on the corner of Rue Saint-Mayeul and Rue de la Chanaise we found what we had been looking for on the wrong side of the house! Our trips in search of Romanesque remains in Cluny have now come to an end, and we have a pretty good idea of what Cluny has to offer when it comes to Romanesque (and other styles) buildings. Obviously not everything ended successfully. Quite a few houses showed nothing Romanesque on the outside; possibly only a few internal walls came from that period. At the location where once stood a Romanesque house, now stands a .... public toilet! A genuine Romanesque public toilet! The picture below was taken from this web page. 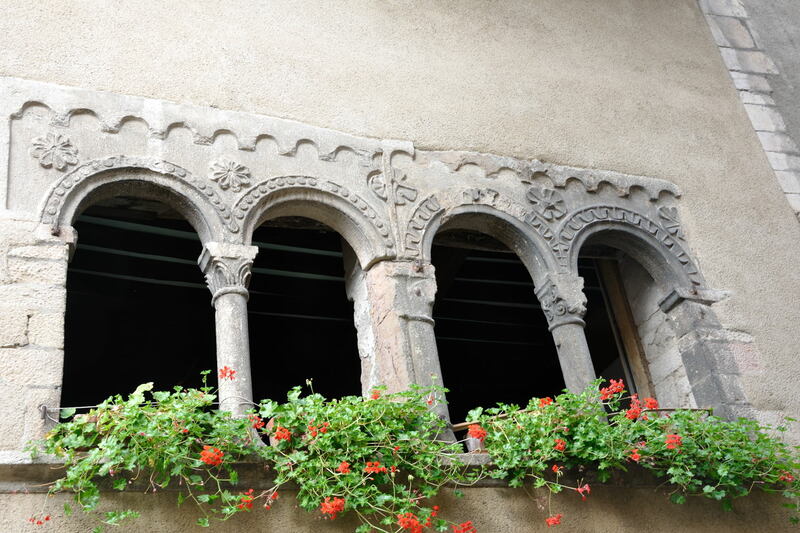 For a number of highlights from the Romanesque period in Cluny, click here. 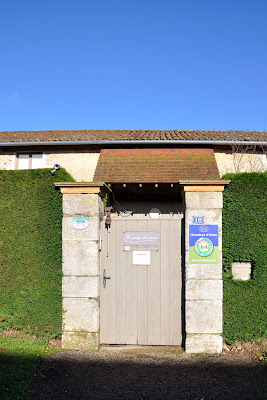 As a continuation of a previous blog about the same subject, we found out quite quickly through our connections with the Office de Tourisme who held the keys to the chapel or church in the cemetery in Saint-Gengoux. That happened to be Monsieur Gérard Mignot, a local amateur historian, who organises guided tours around the town and who wrote several publications on the history of Saint-Gengoux. 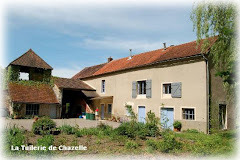 When we phoned him, we had made an appointment in no time, and a couple of days later we picked Gérard up at the OT and drove off to the cemetery. Once inside it, the church was a bit disappointing. 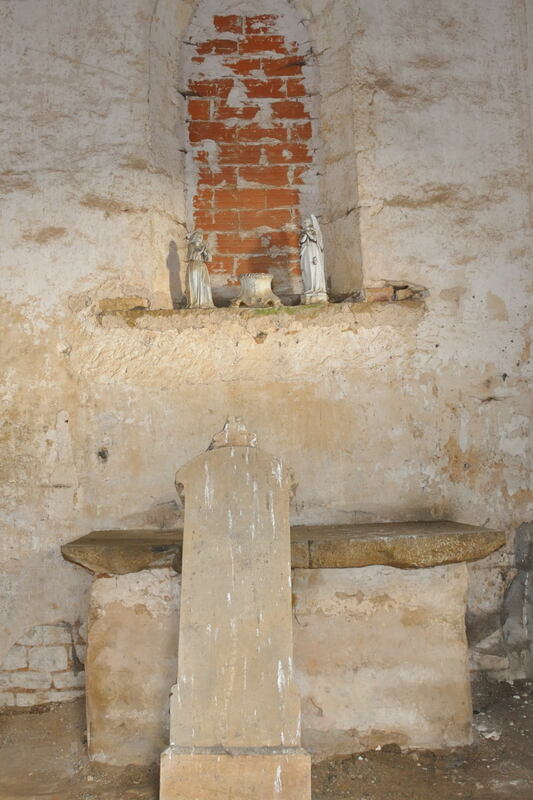 There were two gravestones, one with some inscriptions (in my opinion in Gothic print), an old altar, and the few bits of stonework that were visible did not show anything interesting. Gérard had his doubts about this being the very first church of Saint-Gengoux. He thinks that this once was a church outside the town walls belonging to a leper colony. The original church was more likely located near where the "new" church was built. Again according to Mignot this church was originally dedicated to Sainte-Madeleine or Sainte-Magdalène, who was very popular with lepers. The remaining bit of the church could have been the end chapel of this church, dedicated to the Holy Virgin, whilst one of the transept chapels (both demolished) was dedicated to Saint-Joseph. The church was broken down in 1806 and the stones were distributed among the Jouvenceaux (the name of the inhabitants of Saint-Gengoux). In return they had to close the west side of the chapel with a wall, and make a window in the south wall. 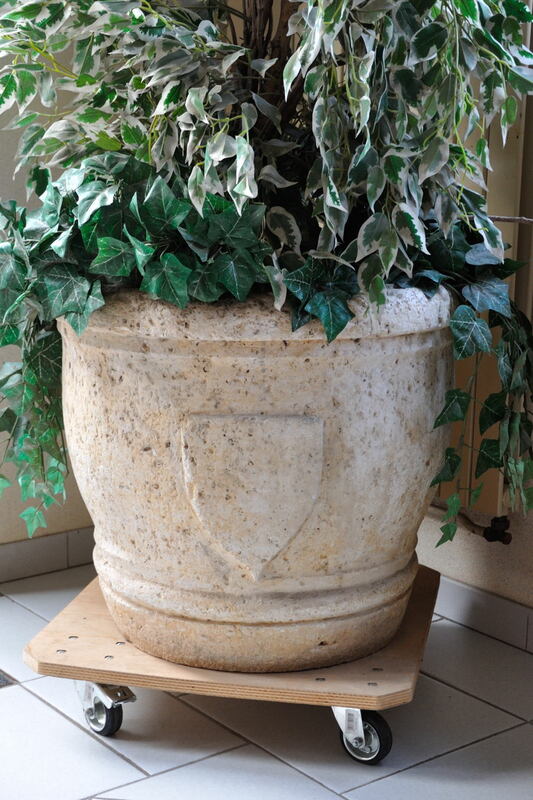 The altar was replaced from the choir to the chapel, and the baptismal font serves nowadays as a flower pot in the town hall. Eduard van Boxtel, who acts as an arbitrator in these matters, thought the whole story in combination with the pictures disturbing enough to take the church off his list of Romanesque churches in Saône-et-Loire. We, on the other hand, have again learned something new and interesting about our fascinating region! As explained above, this information is most likely null and void.